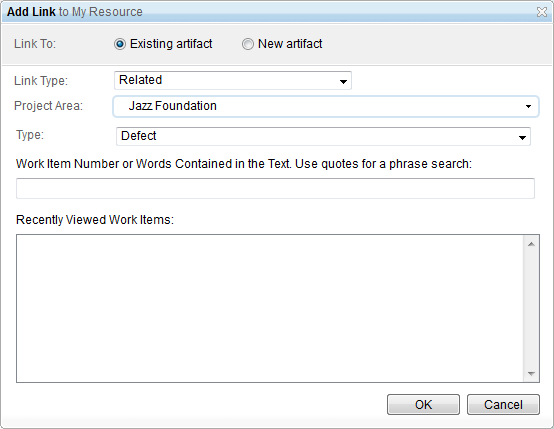 Jazz Foundation 4.0 "New and Noteworthy"
This is a summary of the main new features and improvements in the 4.0 release of Jazz Foundation. Jazz Foundation is an integral part of the Rational solution for Collaborative Lifecycle Management (CLM), which provides seamless integrations for application lifecycle management with reduced cost of ownership and administration, improved cross-product visibility and reporting, and lifecycle integrations. For information about new features and changes in other parts of the Rational solution for CLM, see the Rational Team Concert 4.0 "New and Noteworthy", the Rational Quality Manager 4.0 "New and Noteworthy", and the Rational Requirements Composer 4.0 "New and Noteworthy". When you create a personal dashboard, you can now select a template to provide useful content that is ready for immediate use. A new wizard will guide you through selecting a source of data for your viewlets. You can still create the old default dashboard using the first entry in the wizard. You can now use widgets outside of a Jazz dashboard as OpenSocial gadgets. These gadgets can be embedded into any OpenSocial container. Users can now export dashboard viewlets as HTML snippets and embed them directly into any website. Viewlets can be configured and exported directly from the Widget Catalog or from a dashboard. 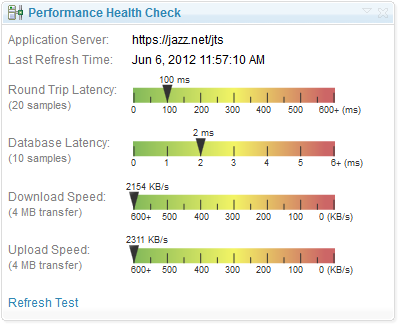 The Performance Health Check widget allows users to run performance tests on the connection between their browser and a Jazz application server. The Recently Viewed widget shows resources that were recently viewed or edited within the application (e.g. plans, work items, test cases, etc.) in reverse chronological order. Its content is essentially a union of the 'Recently Viewed' sections in the capability menus. 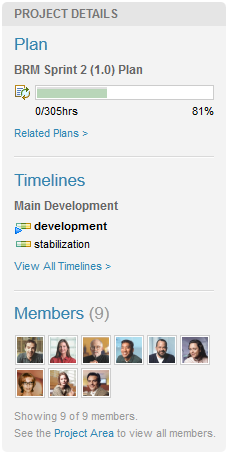 Project and Team dashboards now have a details panel on the right side of the first tab. This provides common information in a location that users will always be able to find. The All Project Dashboards page has been redesigned to improve usability and make it easier to find what you are looking for. The web UI code loading infrastructure now supports the creation of image sprites quickly and easily by using annotations in CSS. The framework automatically scans the CSS and modifies it to insert the rules that are necessary to reference the generated sprites. Sprites are grouped by using a string ID so that components have full control over the granularity of their sprites. The jazz.ui.PageTemplate widget, which provides the common page wrapper for all of the web UIs that are based on Jazz, is updated to eliminate gutters and reduce the number of images that are needed to render it. Also, a new "sticky" navigation bar keeps the navigation bar in view when you scroll. The behavior of the mini dashboard has been updated so that its size remains the height of the visible part of the content area all times, and remains fully in view as the user scrolls the page. If the viewlets in the mini dashboard are taller than the viewport, a scroll bar is introduced. The Web UI has introduced a "My Globalization Preferences" dialog with options to configure your desired bidi and calendar settings. These settings apply to all Jazz-based applications running on the same domain, and can be accessed from the user menu on the Jazz banner. The jazz.ui.HoverPopup widget can now be configured to appear above or below the target node. The login dialog can now be customized to add new content by uploading a Web UI theme. This can be used to broadcast messages or include links to support resources or specific legal or security information. For instructions on creating themes see Web UI theme support. Whenever you need to position a menu around a node in your Web UI, use the jazz.ui.MenuPopup widget. This is a super set of dijit.popup with the added behavior that it will automatically reposition and resize your menu when the user scrolls or resizes the window. The jazz.ui.menu.MenuItem widget is a menu item that supports the href property for hyperlinking (as opposed to an onclick handler), selected bullet, and img based icons (as opposed to CSS classes). This item is compatible with jazz.ui.Menu and dijit.Menu and provides a superset of dijit.MenuItem's functionality. Many applications have their own subclassed versions of dijit.MenuItem that can now be replaced with jazz.ui.menu.MenuItem for greater code reuse. A menu item that accepts an arbitrary DOM element as its content. This is useful for adding custom DOM nodes to your menus, such as titles, More... links, images, etc. Supports the isTitle boolean property for applying menu section title styling, and the focusable boolean proprety for controlling focus behavior. This is a common widget for creating links between artifacts in the Web UI. It supports both the OSLC Delegated UI Dialogs specification and contribution of local widgets for easier access to local resources. Consumers of the widget are responsible for providing the available link types and project areas through a series of callbacks. The jazz.ui.ScrollableMenu widget provides a menu that scrolls when its content is too tall to fit within the browser viewport. The jazz.ui.Select widget provides the same functionality as the html <select> element, but with better scalability and support for titles and icons. 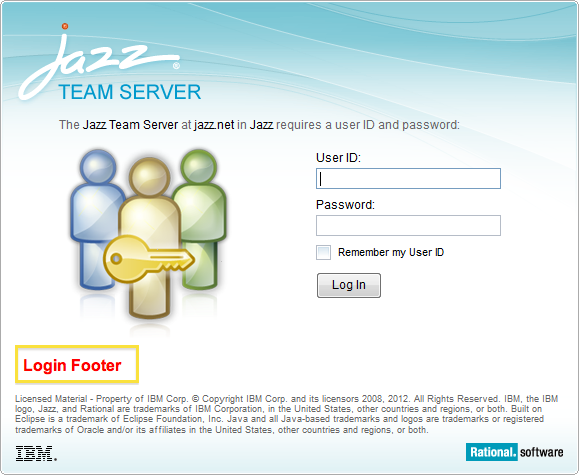 The installation for Jazz Team Server and the Foundation user client access license is divided into separate installation packages. If you start the installation from the launchpad, both packages are selected by default. Refer to http://jazz.net/library/article/818 on jazz.net for the latest information on supported scenarios and to determine whether your topology is supported. As part of server rename, a centralized command is provided to import URL mappings into the Jazz Team Server. When the server is restarted, a centralized rename status service is also provided. This service runs on the Jazz Team Server and polls all of the applications for their rename status. The Jazz Team Server is in read-only mode while the applications complete their rename. Any requests directed to the Jazz Team Server or the applications during this time are redirected to the global status page of the Jazz Team Server located at https://host:port/jts/serverRenameStatus. After all of the applications have completed their rename, the Jazz Team Server and the applications are ready for use. No restart is required. The ability to define a collection of mappings from old to new public URL prefixes. A Jazz Team Server command generateURLMappings that generates a mapping stub file that contains the best-effort list of all of the prefix URLs in the topology. Administrators can edit this file to specify the new target prefix URLs. A Jazz Team Server command importURLMappings that consumes the mapping file. A feed service, provided by the Jazz Team Server, with the mapping event history. This feed service is used by other applications to respond to URL changes. Reading mappings from persisted URI to current URL and from current URL to persisted URI, for the purpose of mapping opaque content, such as rich text. Testing utilities and services so that applications can build automated tests of the rename function. Many consumability improvements were made to server rename including a new centralized server rename status service. This service runs on the Jazz Team Server and polls all of the applications for their rename status. The Jazz Team Server is in read-only mode while the applications complete their rename. Any requests directed to the Jazz Team Server or the applications during this time are redirected to the global status page of the Jazz Team Server located at https://host:port/jts/serverRenameStatus. 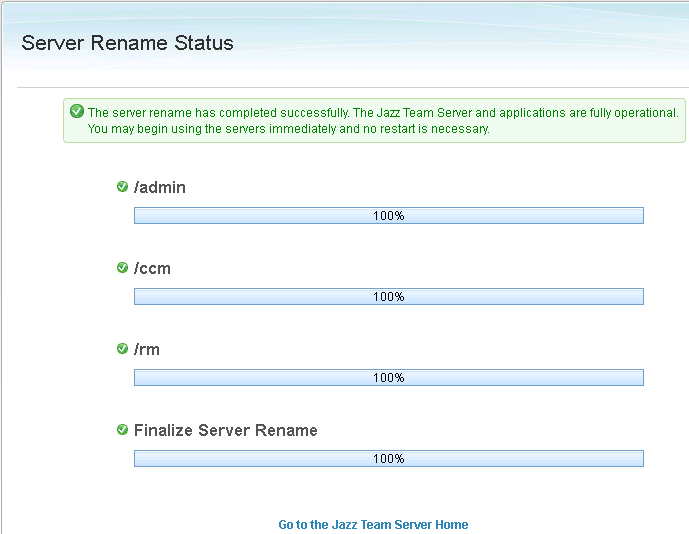 After all of the applications have completed their rename, the Jazz Team Server and the applications are ready for use. No restart is required. The Jazz Team Server & Application Setup wizard has been split into two paths: Express Setup and Custom Setup. Custom Setup is identical to the setup wizard that existed in earlier milestones. A new Express Setup path was created to provide a more streamlined experience for users who want to demo Jazz Team Server. Express Setup configures the server with the Derby database and Tomcat user registry. If any applications are present, the wizard automatically registers and finalizes the applications. The Express path is not intended for use in production environments. To try out Express Setup, open the setup wizard at /jts/setup. A new Cluster Nodes page is displayed on the Server tab in the Admin Web UI when the server is running in a cluster that has two or more nodes. The page provides a list of known cluster nodes and a detailed status report for each node. At a glance, administrators can determine online status, diagnostic information, memory usage, and active services for a specific node. 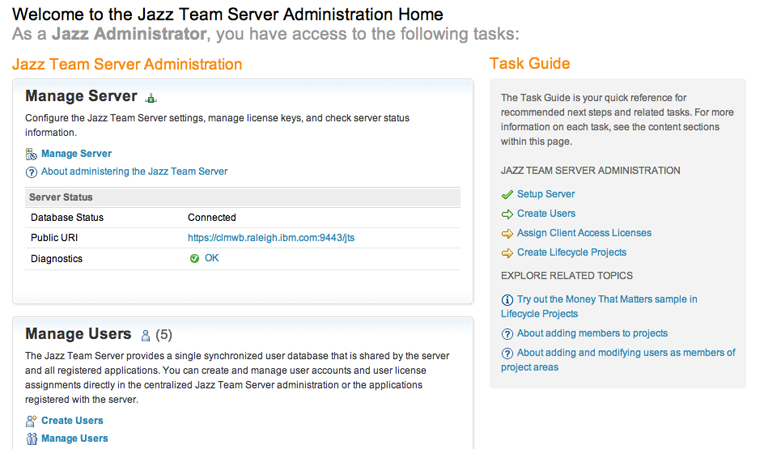 The Jazz Team Server Administration Home page was completely revamped to provide better guidance to administrators who just completed the Setup wizard. The new Task Guide provides a list of recommended next steps, such as creating users, assigning licenses, and creating lifecycle projects. 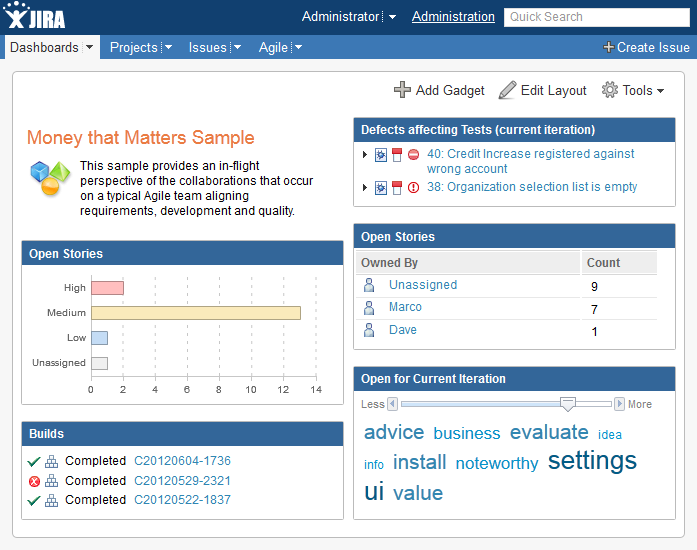 The Home page provides links for managing users, projects, and application artifacts. The Admin Web UI adapts when the server is running in a cluster. The Status Summary, Active Services, and Diagnostics pages provide additional information about the cluster status. The Active Services page shows an aggregate of all of the services that are running on the cluster and the specific node a service is running on. The Diagnostics page runs diagnostics on every node and shows node specific results when relevant. Jazz Team Server now supports multiple default license keys. Administrators can automatically assign multiple keys when they create and import new users. The ability to assign multiple keys is especially useful for creating users who have capabilities that span multiple CLM applications. The Active Services page is updated and now supports sorting services by the requesting a user or running time. Administrators can quickly identify long running tasks and monitor server activity. You can now access the User Administration pages from a menu that provides quick access to creating and importing users. A list of recently viewed users is also included. On the Diagnostics page, you can disable individual diagnostics. In some cases, a diagnostic might fail consistently due to the server configuration. If you want to hide the failure, you can disable the diagnostic. Administrators can now reset passwords for users who use the User Editor in the web client. Users are sent an email that contains a new password. 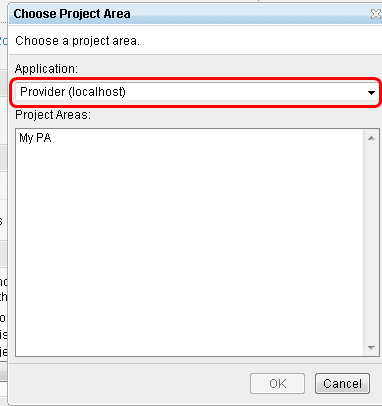 Previously, this functionality was available in the Eclipse client only. The database diagnostic now does a simple measurement of database performance. If the performance is unacceptable, the diagnostic fails. If the performance is only barely acceptable, the diagnostic displays a warning. The Timelines tab on the project area editor in the web client now supports the reordering of iterations by dragging them. In this release, a project area on one server can consume the process from a project area on another server. With this feature, projects on multiple servers can use the same process. For information about configuring servers to use this new feature, see Setting up Servers to Use Cross-Server Process Sharing on the jazz.net wiki. The project area editor in the web client now supports contributing configuration data editors by using extensions that are based on OSGi. For more information, see How to Contribute a Configuration Data Web Editor. On the Process Templates page, you can create a process description for a process template. You can use a new action button to create or edit a process description for each template. The initial version of a new SDK for building applications that are based on the Jazz Application Framework is available. This SDK differs from the Application SDK in that an application can embed Jazz Foundation functional services, such as storage, process, and reporting, directly in the application, rather than access the services remotely in a Jazz Team Server and share them with other applications. The Jazz Application Framework SDK improves the scalability of a collection of interoperating applications. All new applications must be based on the Jazz Application Frameworks SDK, and current applications that are based on the Application SDK must plan to migrate to the Jazz Application Frameworks SDK. For more information about the Jazz Application Frameworks SDK, including a tutorial about building a simple application and a guide to transition fronting applications to the SDK, see the JAF SDK wiki. The distributed data API that was previously available in repository-based applications only is now available to applications that are based on the Application SDK. 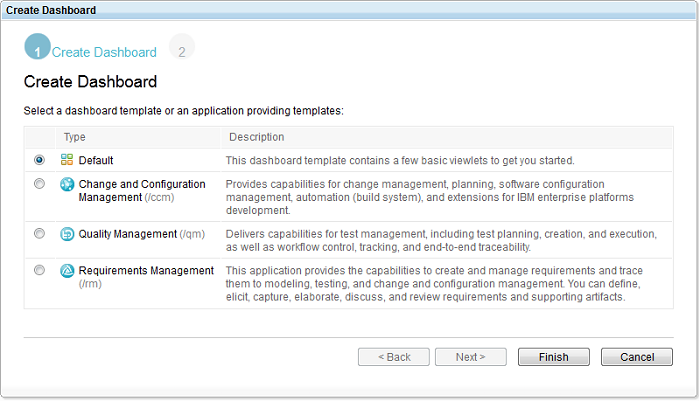 The new API is available as the com.ibm.team.jfs.app.distributed.IDistributedDataService OSGi service. When you use the OSGi service in a repository-based application, the service is automatically configured to share the same clustering configuration as the rest of the application. The API can be used in Application SDK applications that are based on OSGi as well. For more details about clustering, see the ClusteringGuidelines wiki page. The Application SDK now provides new and enhanced utilities that fronting applications can use to support clustered deployments. The com.ibm.team.jfs.app.util.config.BootstrapConfig and com.ibm.team.jfs.app.ConfigUtil classes allow configuration properties to be synchronized across the servers in a cluster so that property values that are changed by one server in the cluster can be propagated to the other servers. The com.ibm.team.jfs.app.friendsconfig.FriendsConfig class allows for the synchronization of friends information across the servers in a cluster. The com.ibm.team.jfs.app.distributed.IDistributedDataService interface describes a service that can be used to share other data across the servers in a cluster. For details about using the clustering support services, see the Fronting Application Clustering Guidelines. The creation speed of a baseline that is based on another baseline is greatly improved. The creation time of the first baseline for a set of resources is still the same. However, the creation time of subsequent baselines on the same set of resources is now proportianal to the number of resources that changed. Local tests show that the creation time is 6 - 10 times faster compared to what it was in 3.0.1. Text search and SPARQL query pagination is now supported in a cluster. You can make the query on one node in the cluster and retrieve subsequent pages on another node. The repotools -compacttdb command now validates the targeted directory. If the directory is not a valid Jena TDB directory, the command will report it and it will not compact this directory. When you run Jazz Foundation Services diagnostics in a cluster, a diagnostic is now shown for each node. Jazz Foundation Services now supports server rename. Jazz Persistent Identifiers (JPIs) are stored in the indexes and the database for the Jazz Foundation Services resource URLs. The URLs are in the baselines, changes, and reindex requests. 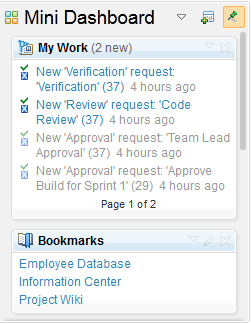 The change service now supports multiple actions on the same resource in a change. Many issues about action validation and commit are fixed in this release. During setup, you no longer need to create the data warehouse ETL user. If you do not set up the ETL user, the ETL jobs authenticate by using internal OAuth mechanisms. The various data warehouse schemas can now have a prefix, so that multiple instances of the schemas can be created in the same database. The data warehouse setup page and the createWarehouse repotools command no longer upgrade the database schema. You can use that page and command to only create the schema. To upgrade the schema, use the new upgradeWarehouse command. The Reporting back-end now supports server clustering. The Jazz Reporting engine no longer writes the generated reports to disk. Instead, the reports are written to a shared area of the database. The Reporting back-end now supports server rename of the artifacts that are stored in the data warehouse. The Jazz Foundation data warehouse ETL now extracts and loads timeline and iteration hierarchy data. Ready-to-use reports now have an additional timeline parameter that cascades to the iteration parameter. This release brings Rational Reporting for Document Generation to the full suite of CLM products. Rational Reporting for Document Generation, which includes the engine technology behind IBM Rational Publishing Engine, is the solution for enterprise document-style reporting in Rational products. If you have reports that are authored with Rational Publishing Engine, you can load them into the CLM products and generated them as easily as you can run ready-to-use BIRT reports. The term report template is replaced with the term report resource. Report folders can be fully managed in the web client. Multi-selection for bulk actions on reports and report resources is supported. A new breadcrumb is added for easier navigation between artifacts.